Successfully Added Slider Cell Phone - Multimedia Twin Slide Gaming Mobile Phone to your Shopping Cart. 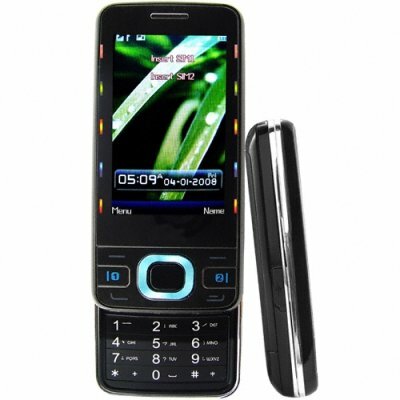 Dual-band GSM/GPRS slider cell phone - Multimedia dual slide mobilephone with Videogames, Dual SIM, FM radio, and Stereo Speakers as its signature features. The first thing you will notice with this mobilephone is the sleek form factor and twin/dual slide feature, which packs two unique button keyboards into one phone. The second thing you will notice is the crisp text. The polarized screen and high screen resolution will simply amaze your eyes. Viewing graphics and text has never been easier on a cell phone than on this one. This model has these multimedia features; FM Radio, MP3/MP4 player, digital camera, digital video recorder, image viewer, sound recorder, and Ebook reader. What makes this model unique is the built-in game pad and NES emulator. You have a long commute or break times every day? Then you are going to love the ability to play all your old favorite NES games on the sharp full color display. As an added bonus, the internal micro SD card slot contains a 1GB card, so the phone comes out of the box ready to start loading up even more games from the internet as well as taking pictures and loading up music or ringtones. Unlike some multimedia cellphones, this one is not locked into any particular network carrier, so feel free to use this unlocked mobilephone with whatever carrier you prefer. This model not only has robust multimedia features, but also includes native dual-band GSM to keep you connected in more than 100 countries worldwide and contains two 1800mAh capacity li-ion battery for plenty of work and play time between charges. While the handy dual SIM slots allow you to keep in touch with business and personal contacts from the same phone. The CVSC-229 is proudly brought to you by Chinavasion Electronics. Order your stock now and don't forget to sell your customers additional add-on accessories to maximize your profits. Does this phone have a Spanish keyboard, can it support the Spanish language? Unfortunately, this phone does not support the Spanish language. Ce telephone est d'une excellente qualité, rien a envier des autres marques, beaucoup de fonctions un design de fou, un son/image irreprochable, une tres bonne autonomie, un systeme double-SIM nickel et une gestion des jeux NES EXCELLENTE!. 2 - Langue Francaise tres mal traduite, je pense qu'il vaut mieux laisser l'Anglais comme langue principale car il est tres simple d'utilisation et le francais n'est pas indispensable.